Recently a graph of snow pack data from the NorthWest United States was brought to my attention. There has been much ado about the loss of this fresh water source due to nothing other than global warming. Here’s a quote from a Real Climate article authored by Dr. Eric Steig Link HERE. The number “50 percent decline” apparently comes from a statement in an Oregon State University report in 2004 signed by many Northwest Scientists. This is not actually the best estimate for average snowpack decline, according to published work by Phil Mote, of Climate Impacts Group at the University of Washington. Mote reviewed the Oregon report back in 2004 and pointed out that the 50% figure was erroneous. Mote’s 2003 paper in Geophysical Research Letters, highlighted in Science a few years ago, cited losses “as great as 60%” in some locations. 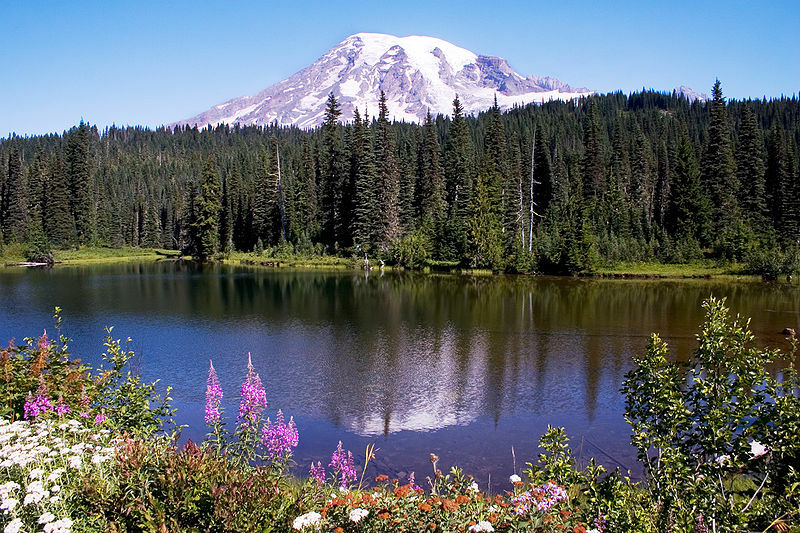 Subsequent work (Mote et al., 2005) attempted to quantify change in total snowpack for the Cascades, and arrived at 15-30% for the period 1950-1997. . This remains the best estimate, even when including the time period up to the present. Furthermore, this number represents measurements at many different elevations. If high elevation stations are excluded, the declines are generally larger, as would be expected if the chief culprit is increasing temperature, rather than declining snowfall. The issue has grown ever larger due to disagreements between scientists over the actual trends. Oregon State climatologist George Taylor was forced to resign and Washington State climatologist Mark Albright was actually fired for making a ‘stink’ about certain statements in contradiction with the data. Phil Mote who was embroiled in the controversy and was recently appointed to Oregon State’s top climate position has been towing the global warming line. It was George Taylor the previoius Oregon State Climatologist who first questioned the 50% decline.As is too often the case in climate science, the actual data is very noisy by nature yet tells quite a different story. Below are a few plots of individual stations measuring snow pack. These plots are of specific stations, however they demonstrate that at least for the above locations the 1950-1997 trend is a cherry pick, nothing more. If you’re interested in the detail, I found the last link quite informative. Before moving on, here is a comment from Joe #21 in the Real Climate article linked above which shows the over politicized nature of snow pack rather clearly. One item that you didn’t mention in your summary of the UW dispute is that (at least according to the Seattle Times article) Phil Mote apparently tried to squelch debate by insisting on reviewing all e-mails issued by Albright on the snowpack issue. When Albright refused, Mote banned him from associating with the state climatologist’s office. Squelching disagreement is all too common in climatology. Anytime there appears to be too much consensus, there is likely an unnatural cause. Both the local and national media were thus quick to jump on the “story” when another UW staff member, Mark Albright, sought to correct the 50% number in a series of emails to the Mayor’s office, among other places. Unfortunately, Albright didn’t simply provide the corrected information, but set up a web site entitled “The Myth of the Vanishing Cascade Mountain Snowpack”, with the very clear message that snowpack has not declined at all. Beyond the appearance of a controversy, this makes for a good newspaper story because it appears to cast doubt on Mote’s credibility. Eric Steig’s questioning of Mark Albright’s credibility rather than demonstrating the data has an effect on my opinion of Dr. Steig. Perhaps he has superior knowledge to other experts who we would expect are quite qualified to have opinions on the actual data but you’ll note the RC article above presents no actual data however there are links to a few papers. Instead, Dr. Steig gives three reasons for his improved understanding over Mark Albright and George Taylor starting with this admittedly Jeff-like statement. So has Pacific Northwest snowpack declined? Emphatically yes. I say “emphatically yes” for three reasons. First, because Albright illustrates the supposed lack of a trend by comparing specific periods (e.g. 1940-1949 vs. 1997-2006), in which snowpack has increased in some locations. This is not very informative, because both the spatial and temporal variability is large, and any question of decline can only be correctly addressed using all the data together, and over a statistically significant time period (30 years or more would be preferred). The first Steig example demonstrating snow pack decrease is because Mark Albright’s actual data wasn’t convincing??? Of course this doesn’t add weight to the snow IS decreasing argument either way so we need to read on. I bolded the 30 year minimum limit comment because it’s a humorously repetitive and very nearly arbitrary refrain in climatology. Eric Steig did follow it up with a link to an amazingly un-detailed report of snow ice decrease by Phil Mote mentioned above, however while filled with opinion and conclusion, there is absolutely no real information I can find in it — summary statement. The second point Dr. Steig makes is a bit of a kluge as well. Second, “yes”, because lost in the media focus on controversy over the exact number is the fact that even a 15% decline would be huge. Using a starting point of 1950 gives you about 30%. Either way, these are big numbers, and represent anything but a trivial change for water resource planners, backcountry skiers, and fisherman (not to mention fish). So Dr. Steig determined a 30% decline in snow pack by some numbers he’s not referenced. The decline sounds substantial but we don’t have the source again for this information as no specifics were given. Well the third reason wasn’t any better. So we have all together the reasons for snow decline being obvious, 1- Albright didn’t prove anything, 2 – Media or an apparently arbitrary 30% decrease in snow pack number or 3 – we know that in the future the earth will warm so it must be true. Pretty weak reasons to question Mark Albrights credibility in my opinion. The tone of the debate (which does exist) in climate science is ugly. So recently a graph of a QC’d version of the snow pack is in review at the Journal of Climate, has been made public by Mark Albright. The data for the graph is HERE and HERE with general documentation of the sources HERE and HERE. 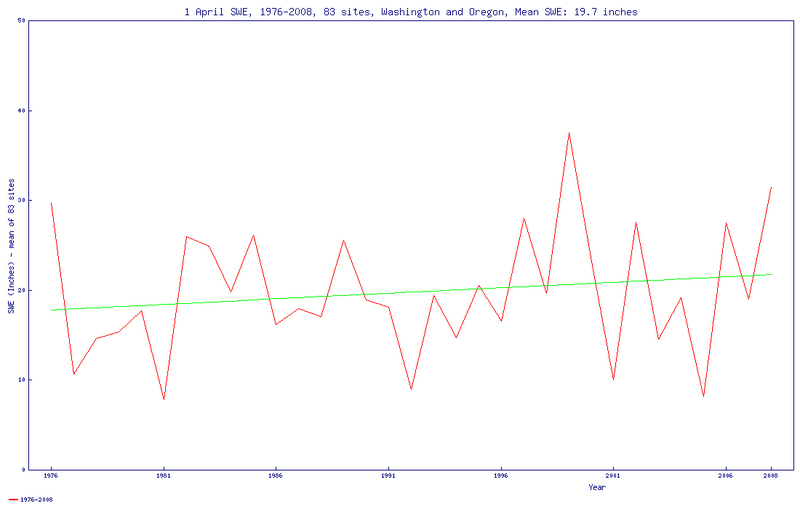 Here is the plot Dr. Eric Steig’s requested of 30 years of snow pack data trends in Washington and Oregon. So, now that the 30 year trend has been updated, I expect Dr. Steig would like to revise and extend his remarks. After all if a 15 percent decline is huge (which from the data doesn’t seem reasonable), what about a 15 percent increase! Last month, a study released by the University of Washington shows we’ve already lost 20% of our snow pack over the last 30 years. What does that mean for Washington? – Millions of our citizens rely on snowmelt for drinking water. – Our multi-billion-dollar agriculture industry needs the water stored in snow pack to irrigate crops that feed our families and our economy. – That same water feeds the rivers and streams that nurture the salmon we rely on for food and commerce. – Less water means problems for our clean hydropower system, which provides more than 60% of our region’s electricity. Link to the governors letter with some responses included HERE. This entry was posted on July 21, 2009 at 12:51 pm	and is filed under Uncategorized. You can follow any responses to this entry through the RSS 2.0 feed. You can skip to the end and leave a response. Pinging is currently not allowed. From the graphs it looks like 1976- is cherry picking as well, as ’76 is the most recent local minima. It seems clear though that looking at the entire available dataset, there is little to no trend, and that certainly the snowpack has been increasing the last 30 years. There is evidence of drastically variable climate over the course of less than 1000 years without a CO2 increase. The raised trees were in 120 and + feet of water. So, just curious, how does the ‘Climate Impacts Group’ get its funding? Can we look at the temperature record for the surrounding area ? It could equally potentially be the case that any ice reduction is due to dust carried via prevaling winds caused by changing land use or city particulate emissions or stuff like that. #7 The snow has apparently grown in thickness according to Mark Albright’s data. One other thing that is very important to keep in mind here — the typically quoted snowpack values are for April 1 of each year (as in the plots you provide). This is well into the major part of the annual spring melt, so variations often have less to do with the amount of precipitation received through the winter than with the timing of the melt. A slight warming that moves the melt forward a couple of weeks can have a dramatic impact on the amount of remaining snowpack on April 1 or a similar date, but virtually no practical impact, as the water just flows into reservoirs slightly earlier. A few months ago, I looked into this issue in some detail with regard to the California snowpack when Sec. Chu was using the high-end IPCC temperature-rise projections and the resulting expected 90% decrease in (April 1) snowpack in the Sierra to warn of the end of agriculture and cities in California. This is potentially problematic, because the earlier melt could overwhelm the reservoirs. But then an alarmist sent me a paper (that he thought would convince me that it was a real problem) in which UC Davis professors carefully assessed the impact of earlier melts on the state’s reservoir system. Even using what they admitted was an unduly pessimistic assumption that NONE of the additional melt before April 1 could be captured (in the existing infrastructure), for the case of the warming corresponding to the 90% reduction in April 1, snowpack, they calculated a 16% reduction in water available to the state distribution to the system. Probably a more realistic estimate would be 10%. Does anyone have good data on the precipitation history in the mountains of the Northwest? That would be more illuminating. Precipitation data is also available. See #9 to get started. I was in the Cascades a couple of summers ago and went to visit Mt. Saint Helens. The glacier that evaporated in the volcanic eruption in 1980 is back and growing. This is no doubt due to extra snow due to global warming which is decreasing the snow pack on all the other mountains. #1 1976 is when the global warming began. From 1940-1976 the world saw a slight cooling trend. So if global warming has caused a decrease in Cascade Mtn snowpack, the period from 1976 to the present is the relevant period to investigate. What background am I missing? That is probably because trend measurements include declines from climate warming as well as increases and decreases from other factors. 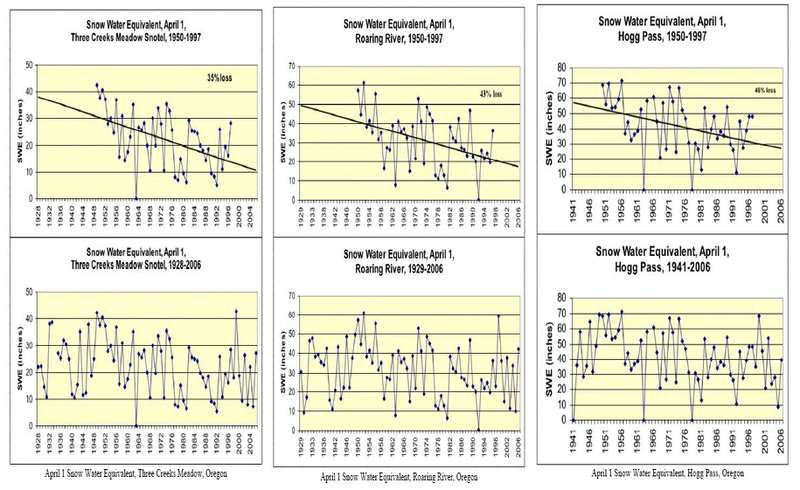 The new research used four different methods to examine decades-long records of water contained in Cascades snowpack in the central Puget Sound basin on April 1 of each year. Scientists used simple geometry to estimate temperature sensitivity of snowpack, made detailed analysis of seasonal snowpack and temperature data, used a hydrological model to examine the data, and analyzed daily temperature and precipitation measurements to estimate water content of snowpack on April 1. If you assume precipitation is the same every year and look at the effects of temperature alone, all the ways we examined the data converge at about a 20 percent decline in snowpack for each degree Celsius of temperature increase. The text you quoted was intended to keep you from believing what your eyes tell you when you look at the actual data (as Jeff has done). Of course, it also glosses over the cherry picking they have done themselves by starting their graphs when the snow was at the highest possible levels. They then go on and say that their magic techniques (four of them!) tell you that it is really decreasing at an enormous rate – it’s just that the pesky natural climate variability has been covering up the decrease that they KNOW is there. While there still is uncertainty in the trend data, people can expect to see lower spring snowpack more frequently in the future, with low-snow winters bringing low-flow summers, Casola said. Yes, the lack of a trend is covering up the trend we know is there. eh? I don’t understand this. They point out quite directly that no decline but rather a slight increase is seen when only the last 30 years are analyzed. How does this keep me from looking at the data and believing my eyes? With regard to the four different analyses, I will withhold my judgment until the paper is out. They may have a point there or they may have not. They intimate in the interview that they have dealt with these described “uncertainties in the trend data” (which any reasonable person could quite objectively point to just from looking at the data graphically) and, despite the way it might look, using their combination of mathemagical manipulations, they have conclusively shown that the snow loss is occurring. You see – the argument is working. No, it’s not working. I am withholding judgment. This means I do not believe them (yet) — but I also do not believe that they are wrong (yet). The only information I have so far that there is no visible decline (and even a light increase) in the last 30 years, which has been pointed out by them, and confirmed by Jeff. Great explanation. Cool dog. Woof! Woof! No, it’s not working. I am withholding judgment. This means I do not believe them (yet) — but I also do not believe that they are wrong (yet). That’s the whole point of what RomanM is getting at. They mask the obvious result with a bunch of technical jargon and equations to create an effect that is not there. They don’t need to convince you, they simply need to sow doubt that the obvious result may be wrong. Indeed, it is working, and you cannot even recognize it when it is pointed out. What is going on here? We are talking about science. Of course, the obvious result could be wrong. They will need good data to convince me of that, but it is a possibility. I do not understand how you could accuse them of obfuscation and dishonesty without having a good luck at their methods and their arguments first – and I am pretty sure you cannot get at this from just a news story. This reveals an incredible biased standpoint, without any scientific justification. Who said the conclusion was simply from “just a news story?” Jeff actually analyzed the data behind the story. Where did you get an accusation of “obfuscation and dishonesty?” There’s no reason to suspect these guys don’t believe what they have done. Steig, in particular, has a known reputation for making much ado about nothing out of a lack of understanding of his techniques, not malice. Apparently you don’t get it. RomanM simply pointed out that these guys went to great lengths to come up with a mathematical reason to explain why an otherwise known trend – a trend that is easily discerned through direct analysis – is incorrect. The “obvious result” is the scientific result. The simples conclusion, i.e., the fact that the trend is what the trend is, is the scientific conclusion. These guys came up with a method that confirms their bias, not the other way around. No, Paz, the standpoint is not biased, it is the scientific standpoint. Trust the actual data first, rather than some complex model that confirms your pre-conceived belief about the data. No, you've seen some of the data above. I do not understand how you could accuse them of obfuscation and dishonesty without having a good luck at their methods and their arguments first – and I am pretty sure you cannot get at this from just a news story. As Mark says, no one accused them of dishonesty. However, from a news story , you can get an idea of what they claim they’ve proved. The person interviewed is a Ph.D. student who must have used some really powerful methods to be able to get the claimed results from data such as what is shown above. As well, there are other persons familiar with these issues who have questioned their results. This reveals an incredible biased standpoint, without any scientific justification. That and Jeff’s analysis is pretty plainly shown above, without need for any editorializing or obscure mathemagical tricks (a simple least squares fit). To claim there is no scientific justification for such an opinion is, well… it doesn’t take any math to come to a conclusion about such a claim. No, you all are being silly. Jeff forgot to do PCA on this, which is why the trend looks like it’s going up. But it’s really going down. Fast. Even faster if you RegEM it. Follow up on Cascade Snow Levels. Here is the link.